Highlands Stud part of Ridgemont’s exciting new stallion Canford Cliffs could be represented in one of the world’s truly great races this Sunday. At the time of writing, Canford Cliffs’ four-year-old son Salouen remains in the field for the 2018 G1 Qatar Prix de’l Arc de Triomphe, which is due to take place this Sunday. Trained by Sylvester Kirk, Salouen, whose earnings are just shy of £450 000, is yet to finish out of the first four in 2018, with his placed efforts including a head second to multiple G1 winner Cracksman in the G1 Investec Coronation Cup. To date, Salouen has finished in the first three in eight group races, with his other notable placings including a runner up effort in the 2016 G1 Prix Jean Luc Lagardere. The five time G1 winning Canford Cliffs’ progeny have been firing on all cylinders of late, with the son of Tagula’s recent winners including juvenile scorer Our Rodney, and talented Australian galloper Cliff’s Edge. 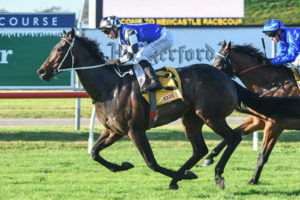 The latter, whose previous victories include both the G2 Alistir Clark Stakes and G3 Caulfield Classic, recently picked up his seventh career score when landing a handicap over 1400m at Caulfield last Sunday. Cliff’s Edge has now banked more than AUS$800 000 in prize money. A most imposing bay, Canford Cliffs is currently responsible for more than 20 stakes performers with his top runners including such group winners as Most Beautiful, Painted Cliffs, Al Jazi, the above mentioned Cliff’s Edge, Princess Posh, and Princess Asta, as well as the dual Oaks placed Harlequeen and 2018 Melbourne Cup entrant Wall Of Fire. Canford Cliffs, whose handful of South African runners include G3 Three Troikas Stakes winner Fish River and Derby hero Dorset Noble, has settled in really well at Highlands, and has been very well received. An easy horse to mate, he will suit a wide range of mares and is set to cover over 100 mares in his first season in South Africa.